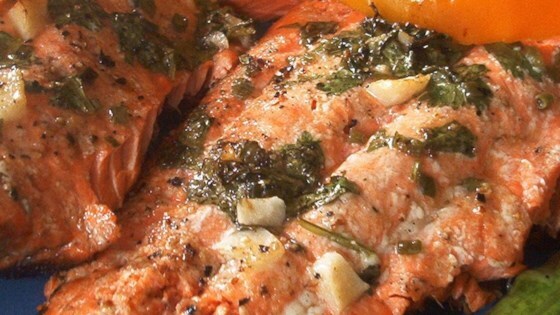 "A delicious, healthy lemon-garlic marinade for salmon with cilantro and red chili flakes. Marinate at least 6 hours. Broil in the oven or grill 7 to 8 minutes per side." See the Knutson family recipe for pan-fried wild salmon. I really didn't like this. It was a little too sweet and lemony for my taste. This was good, I really enjoyed the cilantro flavor. We had it with grilled asparagus, grilled orange peppers, and some garlic bread. Great recipe. Tastes awsome on the grill. The only thing i left out was the cilantro and it was still delicious! I always use this marinade for salmon now when bbq'ing.